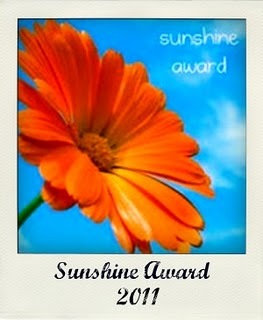 I was lucky enough to receive a Sunshine Award from http://birgitscorner.blogspot.com/ So nice of her and I was really grateful! • Pass it on to 10 bloggers who you think really deserve it and send them message to let them know. Favorite color: I like Hot pink and fuchsia shades, I always go for them in lipstick and shoes and dress and tops and jackets lol Seriously! Something you always wear with you and identifies you: Don't think I can think of one, I was known for always having my hair down and never tying it up I guess that would be it. What’s your passion? : Make-up, which makes me sound like a girlie girlie but it not just applying make-up it is the theory behind make-up and the history not just about wearing it. What was the last eyeshadow you used? : Mocha by ELF which I love, you can see swatches of it on my swatches tag. Favorite day of the week: Wednesday or Saturday not sure why though. Are your nails painted right now? : Yeah on my hands I have Essence 07 Wanna Kiss? and on my toes I have NYC Hot Pink. NYC's Hot Pink is one of my favourite polishes at the moment, I just love the colour. I adore it, NYC have great colours!